Feed Your Mind! Change the Way You Eat. – Go Veggie Go! The saying goes, “The mind is a terrible thing to waste.” Today’s selection of books will surely be a tasty treat for your mind, Locally Delicious; The Grapes of Wrath, and The Parable of the Sower. May they serves as recipes for inspiration. Enjoy! Published in Arcata, California, the publication is filled with a wide variety of resources that for local cooking, baking and eating in the Humboldt county region. The book compiles recipes, personal narratives, and full color photos of the food, animals, plants and the people involved in the care, cultivation and preparation of Humboldt’s vibrant produce. The appendix of Locally Delicious includes listings of the farmer’s markets, restaurants, information on community supported agriculture (CSA), and even supplemental information on foraging, fishing and hunting in the region. The recipes of the book focus on seasonal platters, using ingredients that can be acquired in Humboldt. Locally Delicious places a focus on eating locally by citing its benefits such as fresher food, and a diverse community and economy. In emphasizing on a localized diet Locally Delicious also takes a stance on industrial agriculture, citing the effects that monocrops, pesticides and GMOs have had on the region and the people. A fictional narrative set during the depression era, Steinbeck’s novel the Grapes of Wrath follows the Joad family as they venture away from the dust storms in Oklahoma to sunny California. The tone of the text is one that is sympathetic towards the plight of the migrating family, painting both the Joads as well as other migrants as humble people who want nothing more than the ability to work. As a piece of fiction the novel provides a window through which one can see the rise of industrial agriculture within America. A large focus of the novel revolves around the changing practices regarding the cultivation and harvesting of produce. Throughout the novel Steinbeck utilizes elements of the developing American road culture to tell the story of the Joad family. Steinbeck draws attention to things such as cars, campsites, roadside diners and even service stations, the effect is that the reader is provided with a wider scope of reference through which he/she may examine the depression era. The window that Steinbeck provides also allows the reader to see the ecological turmoil that prompted the mass migration of Oklahomans and other Americans. One of the pitfalls of the novel is the suppression of nonhuman nature. Steinbeck presents the dust as thing that is separate from the people, a thing which imposes itself onto the land and causes death. Thus the concept of the dust acting as a element responding to ecological stress, caused by farming practices, is not examined. The dystopian Californian road-novel evokes literary elements similar to those seen in Steinbeck’s The Grapes of Wrath–mass migration and ecological turmoil due, natural man-made disasters. The heroine of the novel, a multi-ethnic adolescent named Lauren Olimina, caravans from Southern California to Northern California and during her venture challenges social, gender and racial norms. 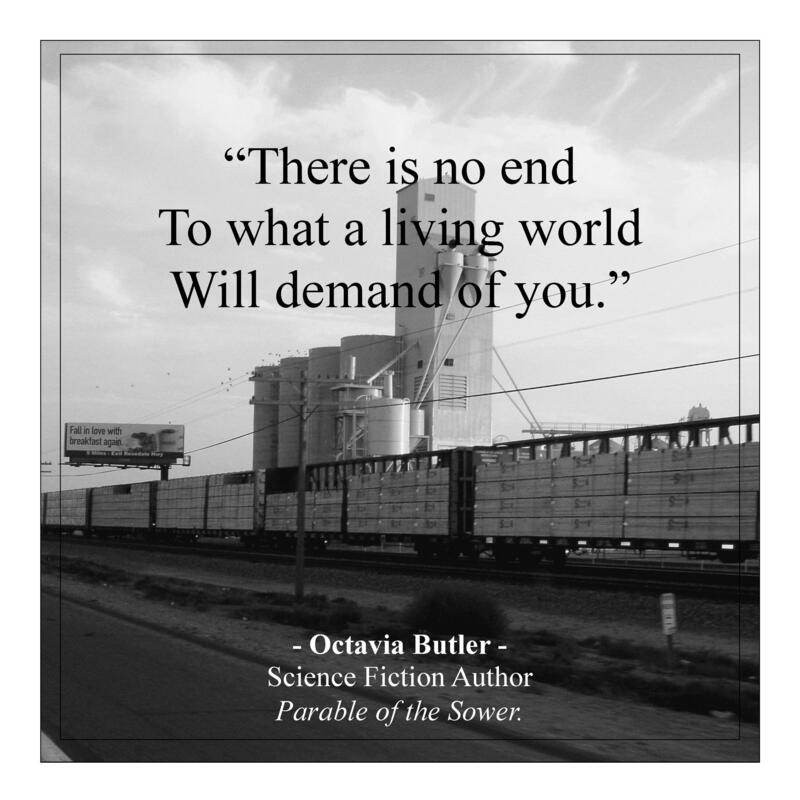 In doing so, the author of the novel, Octavia Butler presents meta-textual commentary on issues of race, class, gender and ecology. In Lauren’s world violence, plagues of fire and numerous crime waves are a way of life, however she is sensitive to the plights, struggles and pain of others–including family, animals, thieves and even harlots–she feels their strife, literally. What makes her an fascinating and empowered character is that she feels that she has the ability to shift the paradigm of violence around her. Her confidence in a paradigm shift is detailed within her “Earthseed” verses; a series of journal entries which discuss are astute observations on human interconnectivity and the circular nature of life on planet Earth. Each of her Earthseed entries is written as poetry but like her hypersensitivity, is kept private due to a fear of being ostracized or exploited. This text is listed on the California Department of Education recommended reading list curriculum.